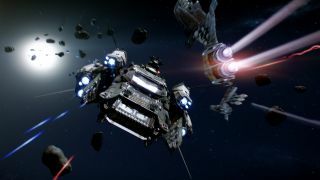 Star Citizen is a game about space, and spaceships. Except when it isn't. Then it's a game about shooting people in first-person, or hanging around on planets. It's all of these things. And more. The above video was created for SXSW festival, and it shows a montage of the modules currently and soon to be available for the game. In addition to the space fights of Arena Commander, we also get to see some first-person shooting, and the upcoming social module. Chris Roberts' full SXSW presentation is planned for release later this week.